I know I am always doing it: the very opposite of what you're supposed to do. The etiquette is: you don't puff the work of your friends. Indeed, you go to great lengths to avoid mentioning it, lest you be accused of bias. I'm quite happy to be accused of bias. I am biased in favour of those of my acquaintance who just happen to be good writers. Because I'm a writer, I have a lot of friends like this...and Sally Prue is one of them. I make a point of bringing their latest work to the attention of the wider world and I don't feel in the least guilty about it. I have, I promise you, a HUGE pile of stuff by people I know which I have no intention of reviewing. Sally Prue's little book needs critical attention for two reasons. First, because it's good but more importantly, it's one of a specific kind of book which never gets noticed at all. This is the small, not very flashy narrative for younger readers: the kind of thing you'd find in a classroom but not on the pages of the Sunday Times. These are often the books to which children have most access. They are short, which means that they're accessible at a time when readers need good meaty stuff to move them on to really demanding books. They must be simple without being stupid. This is not as easy to achieve as it looks. It helps when there's an occasional line drawing to pull the child through the story. It helps greatly if they're funny. And if they're written by someone who takes as much care with every sentence as Prue does, then the readers are in luck and this slim volume will be excellent exercise for those parts of the brain that are needed to turn children into enthusiastic lovers of every kind of book. 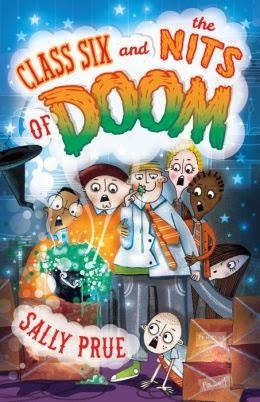 Class Six and the Nits of Doom.... an immediately interesting title...poses a what if which has probably often crossed the mind of disgruntled pupils: what if Miss is actually a witch? I'm not giving too much away when I tell you that this year, in Class Six, Miss is not only a bona fide witch, but also one who doesn't limit herself to the more fluffy and child - friendly enchantments. On the contrary, these spells can be properly nasty and the way Class Six copes with them strikes me as admirably stoical. Not only that: whenever someone suggests getting adult help of some kind, his or her fellows say, to all intents and purposes, "Naah, don't bother, they won't believe us. " So the pupils deals with this predicament as best they can. The dénouement, when it comes, is exactly right. But along the way there are the incidental delights of Prue's writing, which is both hilarious and quite sharp. Also, the fact that Class Six can be going through what it is going through while the rest of the school goes on around it unawares, says something quite profound about the way we deal with problems affecting our close neighbours but not ourselves ....this is something to go on thinking about when the fun and games are over. Whatever its deeper significance, Prue has written a jolly good romp which moves at a cracking pace and those who've just begun to read fluently will love it. Indulgent readers please excuse the change of FONT in the middle of this...I prefer the second font. I will try and correct the anomaly when I get back this evening. Sorry! This sounds just the sort that children enjoy finding on the school book shelves - the kind of story that brightens "reading time" and matters at an important stage of reading. As you say, Adele, such writing takes real skill. My children, 5 and 7, adore this book. We've had it twice at reading time, and it never fails to elicit howls of laughter, especially the gorgeous Slacker Punchkin, whose name alone makes my son giggle like a lunatic.